ABOVE, Past Chairmen of the Chamber Board over the last 40 years gather for a group photo, to socialize, and to watch a video presentation of their accomplishments documented in pictures. 23 of the chairmen were present. Shalonda Dawkins noted in her introduction that some of them had passed away. HOUSTON – Several hundred guests and Chamber members gathered last Saturday night at the Houston Hobby Airport Marriott Hotel, for a grand evening of good food, socializing, reminiscing, and dancing. The occasion was the observance of the 40th Anniversary of the North Channel Chamber of Commerce. The evening was a benefit fund raiser for the chamber, as well as a happy and historical occasion. A silent auction with a number of very special items kept the bidding lively. Master of Ceremonies was chair-elect Shalonda Dawkins, and awards were presented by past chair Lucia Bates and chamber president Margie Buentella. The evening included the swearing in of the new Chamber Board for 2017, with Constable Chris Diaz officiating. Jacinto City, TX. Thursday, January 26, 2017 — At the City Council meeting Mayor Ana Diaz and former Mayor Allan Jamail recognized volunteerism in the city. Each volunteer received a certificate of recognition for exceptional dedication and volunteering services to the community signed by both Diaz and Jamail. At the close of the city’s business meeting but before adjournment the Award Ceremony consisted of certificate presentations, a Zumba exercise dance by Lupita’s Crazy Energy Z Fitness (832-882-3562), magic tricks performed by Chispirrin Magic Show (832-909-4915) and Norteño Mexican folk music by brothers Edgar Salinas, Oziel Salinas Jr., and Felix Ochoa. Refreshments were donated by Constable Chris Diaz. In a separate ceremony at City Hall Special Volunteer Appreciation Awards was presented to fulltime city officials, City Secretary Joyce Raines with 30 years of service and City Finance Manager Kathy Greiner with 38 years of service for their valuable volunteer service to the city. Both Mayor Ana Diaz and former Mayor Allan Jamail praised Joyce and Kathy for annually giving more volunteer hours to the city than anyone. City Manager Lon Squyres said Joyce and Kathy never complain about staying after work or doing what may not be within their job description. They adapt to whatever happens and always have a can do attitude no matter the task, in short, if I had to sum up their role it would be that they are the glue that holds Jacinto City together Squyres said. NORTH SHORE ROTARIANS learn about Bull Riding from Gary McHenry, left, by acting it out. Participating in the fun are Charles Grant, Don Spies, Matt Davis, Scott Stephens. 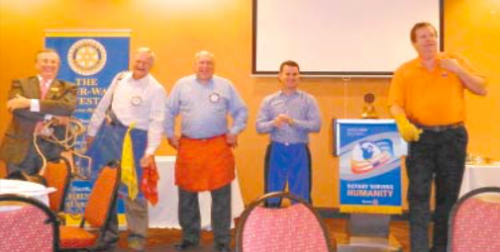 NORTH SHORE – Gary McHenry, chairman of the Speakers Committee of the Houston Livestock Show & Rodeo, made a presentation to the Rotarians on January 19 at their weekly luncheon. McHenry covered the usual fact, such as 33,000 volunteers, $430 million in scholarships since the beginning, today’s scholarships of $20,000 for 4 years, and more. This year’s show runs for 21 days, and starts Tuesday, March 7th. He mentioned the first performer was Gene Autry. The show is basically for and about agriculture, and students that are in that field. But the talk took an interesting twist, when McHenry told about bull riding, one of the most popular events. He said that a rider only had to stay on the bull for up to 8 seconds, and in a full 20 day show could earn $56,000. To better understand bull riding, McHenry dressed Rotarians in costumes and acted out a bull riding sequence. Imagine a clown, a cowboy rider, a barrel tender, a bull, and a matador type, and the club watched their moves, and listened to an explanation.